Cleveland has forgiven LeBron for the infamous 2010 free agency, so let’s talk about something different, namely Ted Stepien, who owned the Cavaliers from 1980 to 1983 and is quite possibly the worst owner in NBA history. For starters, Stepien was obsessed with race, aiming to maintain a racially balanced team because he was convinced that you can’t make a lot of money off black fans alone. He also fired beloved play by play announcer Joe Tait, which resulted in fans showing up in record numbers to the last game of the 1981 season to honor Tait and hurl abuse at Stepien. He also fired 3 coaches and hired 4 during the 1981-82 season alone and traded away enough draft picks for the NBA to temporarily institute a rule that prevented trading back-to-back first round picks. After he became public enemy #1 in Cleveland, he considered renaming the team to Ohio Cavaliers and playing in nearby NBA cities like Pittsburgh, Cincinnati, and Toronto. 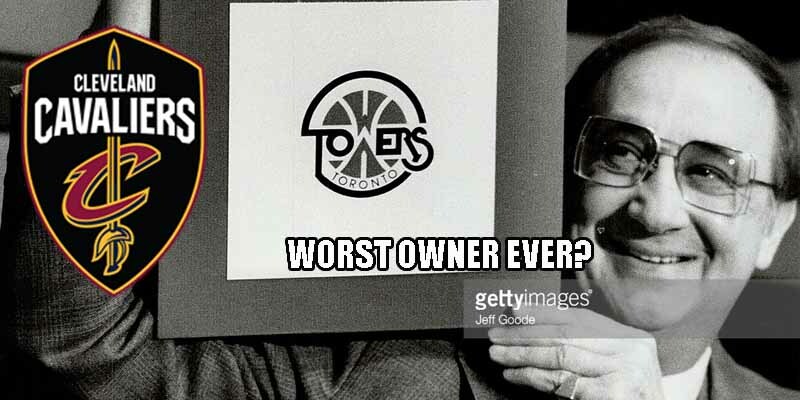 He even threatened to move the team to Toronto and rename it to the Toronto Towers, but then just sold his stake in the team instead.